With one season left before J.D. 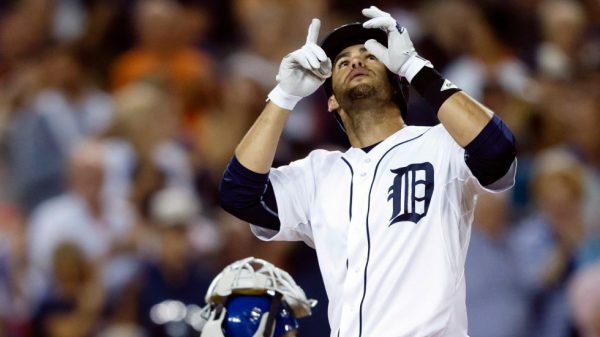 Martinez becomes a free agent, the Detroit Tigers will be looking to sign the big hitting right fielder to an extension as soon as possible. Martinez has one more season left on the two-year deal he signed with the Tigers to avoid arbitration, making $11.75 million next season. The 29-year old is bound to be the biggest name on the free agency market following the 2017 season if he does reach that point, and as long as he continues to hit at the very high level he’s been hitting since joining the Tigers. He’ll be 30 by then, and likely to get a massive deal through the free agency market. His asking price for an extension won’t be cheap either. He has enough financial security to give him leverage and not make him rush into signing a deal that’s more team-oriented, and he’s been terrific aside from his elbow injury this season causing him to miss seven weeks of action. Since 2014 he’s batting .302 with a .907 OPS, clubbing 82 home runs. He has a career high in most hitting stats, including a .317 batting average and .940 OPS, rocketing 21 home runs in 469 plate appearances, all while walking a lot more than before and significantly lowering his strikeout ratio. One interesting factor that could influence how the Tigers handle Martinez’ extension will be Justin Upton. The disappointing left fielder had a terrible first half of the season after signing his six-year deal with the Tigers in the winter. He’s making $22.1 million a season through 2021, but has the option of opting out following the 2017 season. From the looks of things now (25 home runs, batting .236, .727 OPS), Upton would be wise to opt in and stay in his contract with the Tigers, because the market will be heavy with good hitters. Either way, extension or free agency, Martinez is going to land that big contract that takes him into his golden baseball years, as long as his production doesn’t take a turn in the wrong direction. He didn’t make the All-Star this season due to his injury, but if it wasn’t for that elbow fracture, he’d likely be one of the favorites to win the silver slugger award, which he also won in 2015.